Sometimes, you win football games. Sometimes, you lose football games. 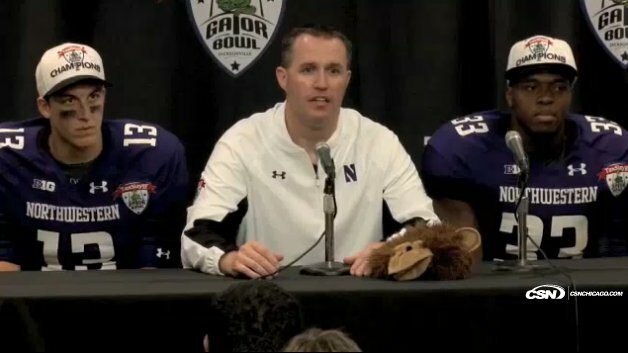 And sometimes, you eradicate a bowl drought nearly old enough to qualify for social security by jubilantly tearing a stuffed monkey asunder in a locker room and then bringing its severed head to a press conference because Northwestern finally won a damn bowl game. With the victory, Northwestern's seniors became the school's winningest class, the Wildcats claimed their third season with 10 victories, and Coach Fitz won his fiftieth game, more than any other head coach. Emotions flew high after the win. Fitz broke down; even his rote "our young men" speeches went from banal, rote coach-speak to inspiring rote coach-speak as you can hear the weight of Northwestern's abysmal football history lifted off of his shoulders. The burden of history continued to weigh on Northwestern football fans with each passing year. For much of the drought, bowls were relatively few and far between, and Northwestern lost most of their games anyway. The 1949 Rose Bowl seemed impossibly distant. The last time Northwestern won a bowl game, Harry Truman demanded satisfaction from Hirohito in a musket duel and the United States was a breakaway dukedom in the Holy Roman Empire. For a long time, Northwestern fans had been content merely to make it to the postseason, but the bowl losses had begun to pile up into an astounding collection of happenings. From the perspective of today, it almost seemed like those bowl losses happened to make yesterday's win even sweeter; that is the only way I can describe what happened in the Sun Bowl, the Outback Bowl, and the Second Alamo Bowl without the use of hostile occult forces because the Lakefill was built on some sort of ancient Mer-Man burial ground with a very specific grudge against mid-tier bowl victories. The game certainly played to the complete opposite of my expectations. Northwestern's defense locked down Mississippi State's passing attack and the offense relied on timely passes to march down the field as they struggled with the Bulldog run defense. The 'Cats certainly benefited from a tough day for Mississippi State quarterback Tyler Russell, who coughed up four interceptions, including an opening pick-six into the waiting arms of Quentin Williams. He was not helped by the excellent play of the Wildcat secondary, who kept MSU's ace receiver Chad Bumphis in check with only 18 yards. On offense, Trevor Siemian came off the bench to deliver an unexpected rushing touchdown and the play of the game on an elusive third-down completion to keep a drive alive. The Bulldogs limited Colter and Mark, but Colter sealed the game with a 31-yard scramble to set up a Tyris Jones touchdown. Freshman superback Dan Vitale continued his late-season surge by leading all receivers with 82 yards. Mississippi State also helped out with several costly penalties, including a penalty for attempting to use 1.5 defenses, and another sideline interference penalty that was nowhere near as funny as the Beckman flag-clobber. The game, though, remained in doubt. The Bulldogs battled back from an early deficit and, at times, looked like they might take over the game on the ground. When they got within a touchdown in the fourth quarter, Northwestern fans instinctively began to strap into their safety seats, put on their mittens, and have their man-servants prepare their purple-plated heart paddle machines. To their credit, Mississippi State refused to give up even after a barrage of turnovers. Fortunately, Northwestern rallied, added an insurance touchdown, and refused to budge in the final minutes, and I am just now nearly able to chew solid food. To be honest, I did not know much about Mississippi State before the game. Northwestern fans were introduced to the Starkville tradition of constantly ringing cowbells for several consecutive hours. Far be it for me to disparage the tradition as a person who has encouraged the defense by yelling and making fist-claws. I'm also thankful that Bulldog fans don't traditionally file their collective nails on third downs, make mewling late-night alley cat noises, or endlessly holler out Snow's "Informer" off the top of their heads for the duration of the game, which would result in a muddled staccato mishmash except on the words "informer" and "licky boom boom down." As someone who could not make it to Jacksonville and watched the game on television, I can only add that the only thing that would have made this historic day for Northwestern more enjoyable would be more delightful banter between the race car guy and the inflatable knight. Northwestern's win was a lone bright spot in a disappointing day for the Big Ten. Michigan and Nebraska lost close games to SEC foes, while Stanford prevailed over Wisconsin in the giant man running into each otherest game of the day. Purdue disappeared in the wilderness. The crappy Big Ten showing was certainly affected by Penn State and Ohio State's bowl bans, which led to unfavorable match-ups against unsporting athletic conferences that refused to suspend two of their top-ranked schools from bowl play out of gentlemanly honor. Bowl season is reserved for ridiculous inter-conference opprobrium that affects rooting interests. Though Northwestern took care of business against an SEC opponent, New Year's Day brought grim tidings to the Big Ten as a whole. Michigan State was the only other Big Ten team to win a bowl game what can only be described as satisfying reverse choke that helped undo some of the heartbreak from the past season. The rest of the conference has caused a whole lot of internet consternation about the Big Ten's inferiority to other conferences, particularly by swaggering SEC partisans. The conference argument is specious and ridiculous, born out of the inherent politicking inherent in college football's arbitrary ranking system. While the Big Ten certainly had a down year, its top teams did not seem overwhelmingly over-matched in their games. More importantly, it is impossible to calculate the strength of the ever-growing Big Ten; teams playing Big Ten opponents cannot be entirely sure that they will not somehow end the game in the Big Ten in a new division called the Lions or the Land Barons or Los Locos Kick Your Balls into Outer Space. Nonsensical conference arguments also mean that we're supposed to support our fellow Big Ten teams in bowls, even though I have spent the last several months whipping myself into a fury of pointless sports hatred directed against their programs. No conference argument was going to deny me the hollow satisfaction of Michigan getting Roy Roundtreed or Nebraska coming up short. How am I supposed to cope with bowl season without feasting on their fans' mild disappointment? I honestly have no idea what else to say about this happy moment in Northwestern bowl game history. I'm thrilled for Coach Fitz and the players, who turned around a season many of us thought would be a disappointment into one of the most gratifying in the history of the program. 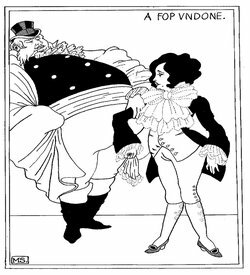 Watching Northwestern's years of impossibly heartbreaking bowl losses are a reminder that a single game is not an indictment of a team's character, but the result of the unpredictable bouncing of an oblong ball and (in my theory), the curse of a vengeful group of supernatural mermen. Even so, it is much more fun when the team wins and then parades around a stuffed monkey carcass. Happy new year, Wildcat fans. Let's all hope the basketball team does well enough to make us suffer through another Selection Sunday.